Valley Forge Fabrics announced today the acquisition of the premier window treatment manufacturer, Contract Decor International (CDI), as part of a strategic move to support their continued growth in the Hospitality Industry. The acquisition will expand Valley Forge Fabrics’ offerings to include vertical window fabrication solutions from decorative textile to install. “Becoming a more vertical supplier and creating value for our industry is a critical piece of our company strategy. Manufacturing and installing hospitality window products and services is a natural evolution and the Valley Forge Fabrics family fits together perfectly with the CDI family,” said Diana Dobin, CEO of Valley Forge Fabrics. CDI is best in class and has a reputation for quality, dependability and flexibility. CDI compliments Valley Forge Fabrics' strategic goals, core values and culture. With the acquisition of CDI Valley Forge Fabrics will be able to leverage their position in the hospitality industry with greater merchandise innovation, new product offerings and design leadership. Going forward CDI will be known as CDI a Valley Forge Company. Based in Massachusetts, the experienced and well respected CDI team will remain in place under the leadership of industry veteran Mike Handler, who is retaining partial ownership of the new company. “Our clients have voiced 2 major pain points in regards to the window, and CDI a Valley Forge Company, will provide new solutions to the marketplace. First, we will be able to move from PO receipt of the textile, to installation of the finished product, at a faster pace than the market has experienced in the past. Second, we will offer one accountable party in charge of the whole process. This will cut down on excess communication and make for a better customer experience,” said Michael Dobin, CEO of Valley Forge. About Contract Decor International, CDI, a 23 year old company is the hospitality industry’s most respected source for high-quality, custom-manufactured window treatments and bedcovers. CDI’s expertise includes complex specialty window treatment design development as well as installation and maintenance services. The company is renowned for its superior customer service and best-in-class seasoned team with deep industry knowledge, product know-how and skills. CDI’s headquarters is located in Massachusetts and has approximately 120 employees. Valley Forge Fabrics, Inc. is a 40 year old family owned and operated company and the world’s largest supplier of decorative textile products for the hospitality industry. 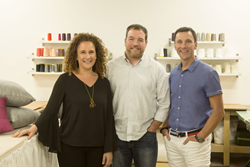 Valley Forge Fabrics focuses on innovation and design through performance textiles, custom textile design, finished bedding, decorative sheers, coated blackouts, and most recently, digitally printed fabrics and fabricated decorative roller shades and draperies. Valley Forge Fabrics is headquartered in Fort Lauderdale, Florida.